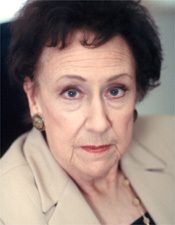 Jean Stapleton was a brilliant character actress, sparkling in small and mid-size roles and occasionally stepping into the spotlight as the star. She was best-known as Edith Bunker, Carroll O'Connor's long-suffering wife on All in the Family and its subsequent spin-off, Archie Bunker's Place. On those shows, she feigned naïveté and subservience and greeted her husband every night with "Hi, Awchie, how was your day?," but Stapleton endowed the character with warmth, accidental wit, and occasional wisdom. And to her bigoted husband's distress, Edith was friends with the black lady next door, gave a cherished tea set to her cousin's lesbian lover, and voted for Jimmy Carter. For her work on All in the Family, Stapleton won three Emmys, three Golden Globes, and millions of fans. When she was not inhabiting the character of Edith, Stapleton spoke without that New York accent, and sang professionally. She began her career with the Robert Shaw Chorale while still in college, and began working as a stage actress in 1941. In a duet with O'Connor, she sang All in the Family's opening theme, letting him bellow the first few lines before joining in, hilariously off key, "And you know who you were then...". In the original Broadway cast of Damn Yankees with Ray Walston and Gwen Verdon, Stapleton's role was small, but her lilting voice rose above the chorus singing "You've Got to Have Heart (miles and miles and miles of heart)". She was in the original cast of Bells Are Ringing with Judy Holliday, Rhinoceros with Zero Mostel and Eli Wallach, and Funny Girl with Barbra Streisand, where Stapleton sang "If a Girl Isn't Pretty" and "Find Yourself a Man." She also appeared off-Broadway in Bon Appetit, performing as an operatic Julia Child, mixing and baking a chocolate cake. In movies, Stapleton's first roles were adaptations of her Broadway plays Damn Yankees with Tab Hunter and Bells Are Ringing with Dean Martin. In other noted supporting roles, she played secretaries in Up the Down Staircase with Sandy Dennis and Klute with Jane Fonda, Meg Ryan's grandmother in You've Got Mail, and the senior citizen who sheltered angel John Travolta in Michael. On television, her first big break was a recurring role on the 1950s soap opera Woman with A Past. Before All in the Family, Stapleton was an occasional guest performer on numerous series, most memorably an episode of the early-1960s lawyer drama The Defenders with E. G. Marshall and Robert Reed, where her character witnessed a murder and fingered the killer in court -- O'Connor, her future co-star. After All in the Family, she was offered and accepted a series that would have had Stapleton playing an amateur detective, but she reportedly changed her mind on her way to sign the contract; so instead Murder, She Wrote was handed-down to Angela Lansbury. In the 1990s, Stapleton starred on TV as Mrs. Piggle-Wiggle with Christopher Lloyd and in Bagdad Cafe opposite Whoopi Goldberg. She first played Eleanor Roosevelt in a mid-1970s speech to high school students, then portrayed the former First Lady in the 1982 TV-movie First Lady of the World, and in her solo stage show, Eleanor: Her Secret Journey. Stapleton's husband, William Putch, was a longtime stage director and producer who ran the Totem Pole Playhouse outside Gettysburg, Pennsylvania, where Stapleton frequently starred. They were married for 25 years until his sudden death in 1983 -- three days before the opening of a comedy he directed, starring Stapleton. Of course, the play went on despite his death, and Stapleton's performance was reportedly hilarious. Their daughter Pamela Putch was a producer on the sit-com Beakman's World, where Stapleton played Beakman's mother, and Caroline in the City, where Stapleton once appeared as Lea Thompson's horny aunt. Their son John Putch had small roles in Jaws 3-D with Dennis Quaid and The Sure Thing with John Cusack, and starred in Impure Thoughts, a 1986 comedy about young Catholics in Purgatory. He also played Stapleton's drug-addicted son in the TV movie Angel Dusted.